A view of Neptune from the Voyager 2 spacecraft. Neptune takes over 163 Earth years to complete one orbit of the Sun - longer than any other planet. 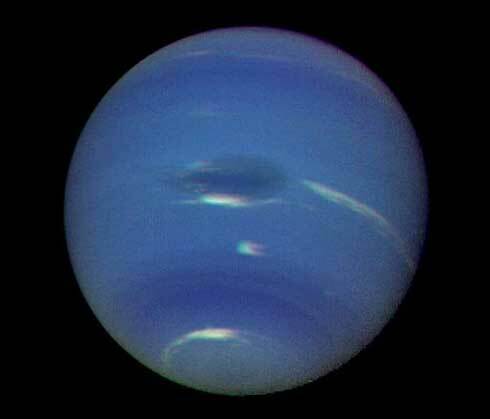 Voyager 2 is the only spacecraft to have visited Neptune, which it flew past in August 1989. In 1846, both John Adams of England and Urbain Le Verrier of France predicted the existence of a planet beyond Uranus based on mathematical calculations of deviations in Uranus' predicted orbit. In 1846, using the mathematical predictions of Urbain Le Verrier, Johann Galle at the Berlin Observatory discovered Neptune. Neptune receives less than 1/1000th the amount of sun light as does the Earth. Neptune is the smallest of the gas giant planets. Triton is the only large moon in the solar system whose orbit is retrograde (backwards).